Smart headphone is a device, which perform various function such as fitness & heart rate tracking, voice-based personal assistants, contextual location-based suggestions, environment-based noise suppression or audio enhancement, and gesture & touch-based control along with is primary function of listening to audio signals. The global smart headphones market is expected to register significant growth in the near future, owing to increase in penetration of infotainment devices, rapid technological advancements, and surge in need for mobility services. However, adverse effect on hearing ability due to excessive usage of headphones is expected to limit the market growth. On the contrary, customers’ increasing need for convenience is anticipated to provide ample of growth opportunity to the smart headphone market. The major companies profiled in the smart headphone market report include Bose Corporation, Apple Inc., Sennheiser Electronic, Sony, Skullcandy, Samsung Electronics, Bragi, LG Electronics, JBL (Harman International Industries, Incorporated) and Koninklijke Philips N.V., and others. The global smart headphone market is segmented based on type, distribution channel, and region. On the basis of type, the market is categorized into in ear, on ear, and others. Depending on distribution channel, it is bifurcated into online and offline. Region wise, it is analyzed across North America, Europe, Asia-Pacific, and LAMEA. 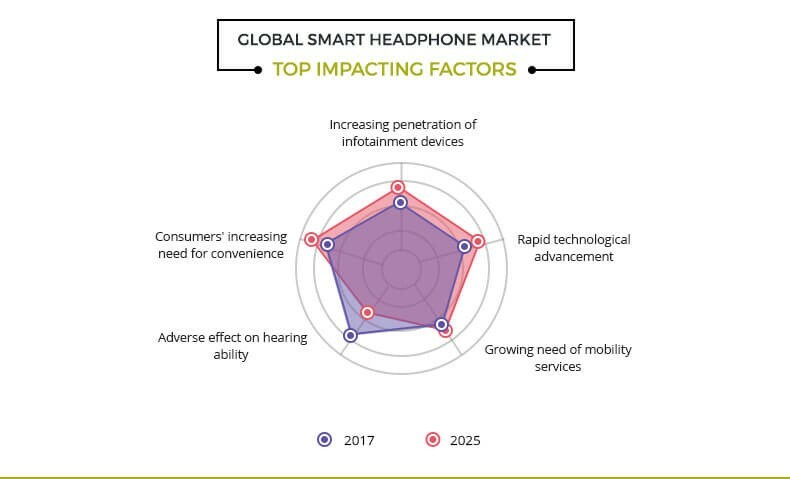 Increase in penetration of infotainment devices, rapid technological advancements, rise in need for mobility services, adverse effect on hearing ability, and consumers' increase in need for convenience are the significant factors that impact the growth of the global smart headphone market. These factors are anticipated to either drive or hamper the smart headphone market growth. The sale of electronic infotainment devices such as mobile phones, laptops, vehicle infotainment device, digital music systems, digital TV, and others is growing at a high rate, and headphones are major accessories for these devices. Smart headsets offer multiple benefits, including convenience; high-definition sound quality; multiple user facility; and freedom from wire maintenance, portability, and mobility. Thus, increase in use of infotainment devices is one of the factors driving the growth of the smart headphone market. Increase in advancements in technology is anticipated to provide lucrative opportunities for the smart headphone market. Implementation of technologies such as Bluetooth/NFC speakers, Wi-Fi, noise cancelling technology, language translation, fitness & heart rate tracking, voice-based personal assistants, contextual location-based suggestions, environment-based noise suppression or audio enhancement, and gesture & touch-based control have led to increase in adoption of smart headphone across domestic and commercial sectors. In addition, significant increase of mobile infotainment devices across the globe boost the growth of the market. Moreover, upsurge in trend of BYOD services and cloud computing are expected to provide potential growth opportunities for the market. Mobility services refer to services that can be accessed anytime, anywhere, remotely managed, provide faster processing, and offer freedom from wire maintenance. Mobility solutions such as BYOD trends, mobile devices, wireless services, and others reduce the complexity of infrastructure maintenance and offer portability, remote access, flexibility, and convenience. With the development of science and technology, the demand for mobile devices such as smartphones, tablets, and laptops has been witnessed to increase considerably for easy connectivity and accessibility of information on the go which is driving the need for mobility services among customers. Which in turn drives the growth of smart headphone market globally. Rapid growth in the use of mobile phones, iPods, and portable music players has fueled the adoption of smart headphones. However, prolonged use of audio devices at certain intensities of sound, for instance, more than 85 decibels (dB) for eight hours or 100dB for 15 minutes can cause temporary, or in some cases, permanent sensory damage. According to the World Health Organization (WHO), nearly 22 million young people have disabled hearing ability due to the unsafe level of sound by the use of wireless accessories. Thus, excess use of headphones has adverse effects on the hearing ability of consumers, which limits their adoption, thereby restraining the growth of the market. In the present scenario, increase in use of portable devices has led to rise in adoption of smart headphones to be used with these devices. Customers seek for convenience, which can be can be delivered by such smart devices. For instance, smart headphones offer various benefits to the consumers such as liberty from maintaining wired connection of devices, easy connectivity, noise cancellation, and others. Thus, this factor is anticipated to provide lucrative opportunities for the expansion of the smart headphone market. This study comprises analytical depiction of the global smart headphone market size with current trends and future estimations to depict the imminent investment pockets. The overall smart headphone market potential is determined to understand the profitable trends to gain a stronger foothold. 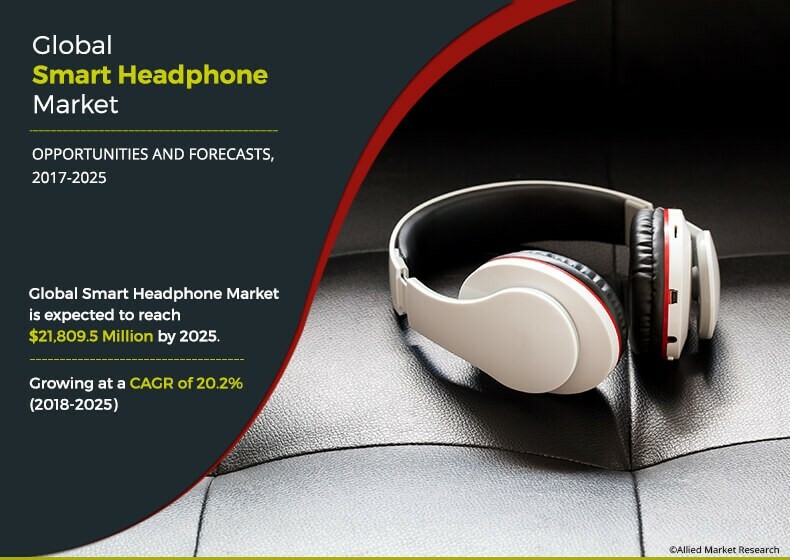 The current smart headphone market size is quantitatively analyzed from 2018 to 2025 to benchmark the financial competency. Porter’s five forces analysis illustrates the potency of the buyers and suppliers in the smart headphone market. The report includes the smart headphone market share of key vendors and smart headphone market trends. 7.1. SAMSUNG ELECTRONICS CO., LTD. The global smart headphone market holds a high growth potential, owing to the development of the electronics system and device industry. The current business scenario is witnessing an increase in the demand for smart headphones, particularly in the developing regions, such as China, India, and others, which further propels the growth of the market. Moreover, companies in this industry are adopting various innovative techniques to provide customers with advanced and innovative product offerings. Increase in demand for technologically advanced devices and increase in penetration of infotainment devices majorly drive the growth of the smart headphone market. However, adverse effect on hearing ability owing to overuse of headphones is expected to limit the market growth. Conversely, customers’ increasing need for convenience provides ample of growth opportunity for the key players operating in the global smart headphone market. Among the analyzed geographical regions, Asia-Pacific is expected to account for the highest revenue in the global market in 2017, followed by North America, Europe, and LAMEA. 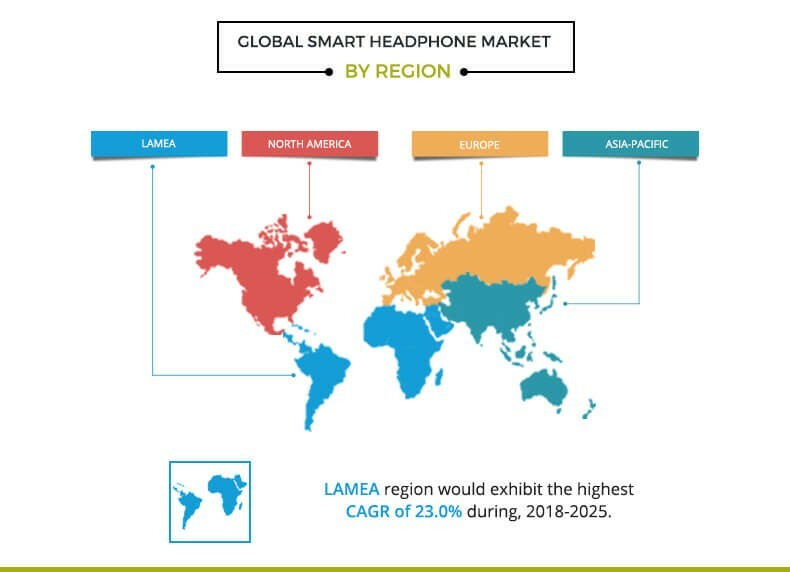 However, LAMEA is expected to grow at a higher growth rate, predicting a lucrative market growth for the smart headphone market. Bose Corporation, Apple Inc., Sennheiser Electronic, Sony, Skullcandy, Samsung Electronics, Bragi, LG Electronics, JBL (Harman International Industries, Incorporated) and Koninklijke Philips N.V., and others are the key market players that occupy a significant revenue share in the smart headphone market.